That's an awesome detailed review of the new Ciaz. Appreciate if anyone can answer the below question. "Coming to NVH levels, the engine is silent while idling and acceptably refined at low revs. However, it is audible above 2,000 rpm. You can always hear the motor when you are accelerating. It starts getting loud post 3,500 rpm, and a lot more so after 4,500 rpm. Near the redline, it doesn't sound as sweet as the City's i-VTEC. Wind & tyre noise are both well-controlled." Is the new Petrol motor really bad when it comes to NVH? Is it a deal breaker? Is the NVH of the new Petrol motor as good or bad as the 1.3MJD in the Ciaz? Thread moved from the Assembly Line to Official Reviews. Thanks for sharing! Fantastic review as always, guys. Rating thread 5 stars . Definitely not my kind of car, but I would have bought it instead of the Nissan Sunny if it was available then. Would be perfect as the family ride. While enthusiasts should steer clear of it (mainly due to the engines), the car hits the bull’s eye by giving the mass market exactly what it wants. Styling (I love its new face), Maruti’s peace-of-the-mind ownership, VFM pricing, space, ride comfort, loads of features & fuel economy. Another not-so-obvious advantage of the 1.5L is that it'll help Maruti in the showroom wars. A lot of regular Joe buyers place importance on the paper specs. Earlier, the Ciaz had a disadvantage as its 1.4L engine was being compared in size to the City’s 1.5L. No more the case. You can see on the sales thread how the Ciaz facelift’s launch has affected the City (IMHO, it’s temporary though). Ciaz is certainly the car to be driven-in. The most spacious and comfortable of all three - Limo like space. It will also be the most fuel efficient car-ever just about everywhere if decently driven, the body shape is very aerodynamic. Your Nissan may survive the occasional bumps and bruises better as expected for a beater car, ciaz on the other hand cannot be parked next to other vehicles, if another car next to you opens the door wide, you`ll have a nice dimple on your door. We have three Ciaz around here (2 diesel ) in our friends circle , one of them have gone through Fuel pump, Steering Column replacement under warranty & silent recall and now SHVS system replacement is being recommended due to cabin noise. Nexa will certainly win the showroom wars, the discounts and the exchange prices on existing maruti`s are very tempting to ignore. Shows how much premium Honda charges for the city since despite losing excise benefit the Verna undercuts the City. There is a rumour though that Hyundai is developing 1.5 ltr petrol and diesel motor. Is it so? As far as I know, if a petrol car is >4 m in length, it attracts a 20% excise tax irrespective of the size of engine (it is 8% if it fulfills BOTH the conditions of <1.2L engine AND <4 m Length). 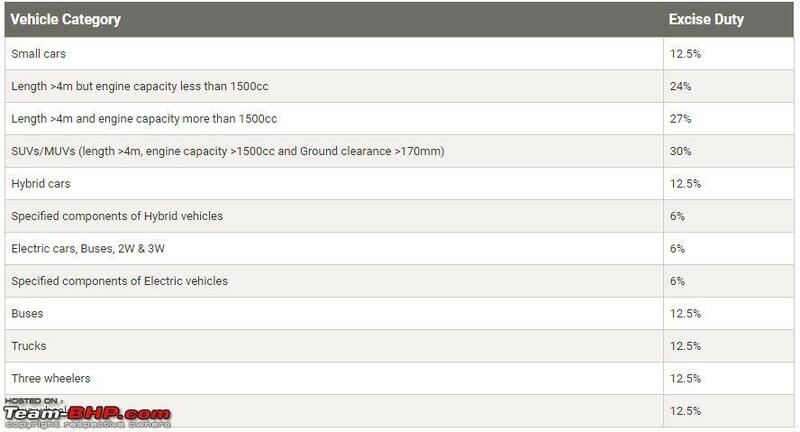 Only thing is, if engine capacity is >1.5L the excise duty is even more at 24%. A very detailed review, as usual from the Team. Thank you! MSI knows the pulse of the Indian market really well and knows what to offer and at what pricing (though there have been occasional mis-steps) and then back it up with best in class service support. I definitely do not like the front end of this refresh while I'm ambivalent about the rear. But that is OK since looks are subjective. My grouse with them (after using a Swift for 8 years) is why do they not have a consistent design philosophy across the range unlike marquee brands (despite using parts that are common across segments). A Ciaz looks nothing like the Swift which looks nothing like the Alto. Admittedly, it is not easy across platforms but hey Hyundai does a reasonable job at it as does Honda and even Toyota. Secondly, with such a massive market share in one of the fastest growing and voluminous markets such as India, why not invest in building safer and tougher cars that do not rattle after 2-3 years of regular use? 'Giving what the market wants' makes you a leader but you ought to leverage the leadership position for overall betterment. I hear about their plans to revamp the vendor system and make them liable for defects and , it is a right step but the effort needs to start from scratch which is design. Smart face, and it gives the Ciaz a big car feel; that along with Maruti badge will bring customers into the showroom. If someone is looking for a beater car, this should be it. And this is where Toyota completely missed the plot with the Yaris. They should have aimed for the Ciaz, but instead tried to play the price game with Honda and got burned. Maruti could have plonked the 1.6L motor from SX4, even though it was old, performance was good. With this motor, the Ciaz would just fly given its lighter then SX4. The old 1.6L on SX4 was identical on power (103 BHP) compared to the Ciaz's new 1.5L engine. The old one would be marginally more thirstier as well. Also, I think it would have cost Maruti some significant investment to make sure that the old 1.6 complies to upcoming emission norms. May have made more sense to develop a new efficient engine with identical power output. Is the new Petrol motor really bad when it comes to NVH? Is it a deal breaker? I did check out Verna Diesel AT and Ciaz Petrol AT (previous version) because my left leg is gotten much older than me of late. While Verna is fantastic to drive, rear seat leg room was a strict no-no from family (they've been spoiled by sitting in the middle seat of Innova). They loved Ciaz though. I had no complaints since I am a sedate driver. I've the same (I think) AT box in my A-star and it works perfectly for my needs. Especially since on the road, it saves me almost 2.5+ lakhs which is more than enough to cover running costs for 5 years between them. I am a sedate driver and my driving pattern is about 1000km per week with 800km on highways - since that is getting difficult to manage with fuel prices, overnight bus for weekend travel will bring this down drastically to pretty much 1500km on highways every month. I would've booked it last month - dealer said it will take 8 weeks for delivery. Then I thought I might as well wait for Marazzo (good one - did a test drive; not sure of spending 16L though), Tata Harrier or a used car deal. IMO, Maruti has a winner - there is anyway much lesser opportunity to be an enthusiast in Indian roads I used to own a Palio - that makes it very hard to accept the flex that Ciaz' sheet metal exhibits. Other than that, perfect car almost. "Coming to NVH levels, the engine is silent while idling and acceptably refined at low revs. However, it is audible above 2,000 rpm. You can always hear the motor when you are accelerating. It starts getting loud post 3,500 rpm, and a lot more so after 4,500 rpm. Near the redline, it doesn't sound as sweet as the City's i-VTEC. Wind & tyre noise are both well-controlled. " Is the new Petrol motor really bad when it comes to NVH? Is it a deal breaker? Is the NVH of the new Petrol motor as good or bad as the 1.3MJD in the Ciaz?Thanks in advance. Looks like you're looking for a new sedan? Drive the competition back to back and decide. I drove the competition back to back and also the Ciaz AT and Manual, early 2017. It was a refined car for the price. I drove the 1.4 AT and with a full complement of 4 passengers with A/C on it masked it's power deficiency very well indeed; agreed the 4 speed may be 2 decades old but it's geared well to city traffic. I almost came within a whisker of buying the Ciaz AT, but bought the City CVT. Compared to the City the ride is plusher and seats are slightly low set. Refinement is good on the Ciaz. To sum it up City feels eager where the Ciaz may feel adequate. That said the Verna's backseat is very low set as compared to both the City and Ciaz, that would be a deal breaker as far as I'm concerned. Last edited by Durango Dude : 10th October 2018 at 17:07. For a petrol motor, even the current 1.5L (or the old 1.4L one) would also not qualify for excise benefits, isn't it? The higher duty is if the engine is above 1500cc. 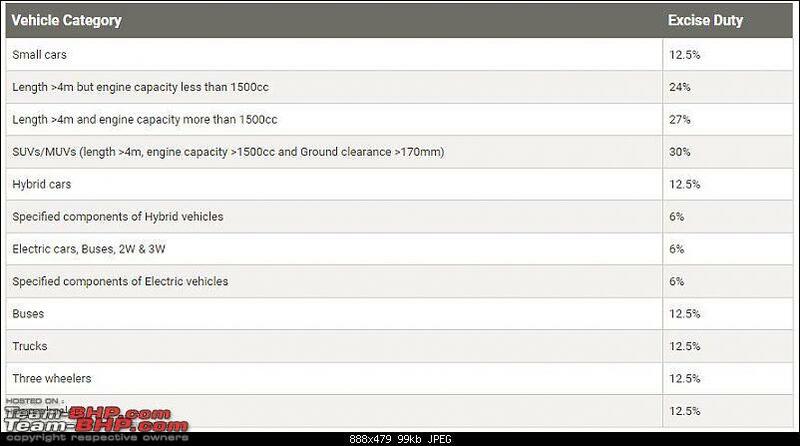 All the 1.5L engines will be 14xxcc, which would make them fall below the criteria. The City iVtec for example is 1497cc, which is eligible for lesser duty. Shows how much premium Honda charges for the city since despite losing excise benefit the Verna undercuts the City. Exactly. Honda always overprices their products saying they are the best in quality . Last edited by swami.n : 10th October 2018 at 18:25. Maruti Suzuki Ciaz is now officially the most-selling C-segment sedan in the country with over 24,000 units sold during the first half of 2018-2019 financial year. - Ciaz averaged over 4000 units, Verna with about 3600 units followed by the Honda City with a little over 3000 units sold every month between April and September this year. - Since its launch in 2014, Maruti Suzuki has sold over 234,000 units of the Ciaz in the country. Last edited by volkman10 : 10th October 2018 at 18:59. I somehow have some reservations on this. Coming from a Hyundai service experience, Maruti service is just a myth. These guys have serious competency issues and found the overall experience (exclusive NEXA experience I mean!!) to be below average, when compared to how Hyundai takes care of its customers. Yes, Maruti does make you feel you have made a difference in buying their product but fails to make it work in their actions. Got my third service (Ciaz Auto) done last Saturday and on Monday, while on a long drive on the Bangalore - Hyderabad road, felt the vehicle was vibrating like crazy the minute I crossed 80. Had to cancel my trip midway and bring the vehicle back to the service center only to be told everything is fine. I lost it and ensured they check the vehicle thoroughly and eventually the technician pointed out to a faulty alignment. Took a good two hours for the advisor to get convinced on the shaddy work done and not acknowledging to the customer concern. I wonder why Maruti have kept the specifications, life and cost of the Lithium battery a secret. Even the car manual is silent about it. The showroom guy too had no clue. Also would the ISG be dependable and cost effective to maintain as the alternator and the starter? Too much electricals, I would stay away as even small glitches would mean towing it to authorised service centres like Audis and Bemers! I would have opted for Yaris at this price point, Hyundai is a brand that I don't believe in though the majority say it's VFM with bag full of goodies. City has become too common, maybe VW need to bring in a refreshed offering soon it makes sense now than later.